Sold on Language offers thought-provoking insights into the choices we make as consumers and citizens – and the choices that are increasingly being made for us. 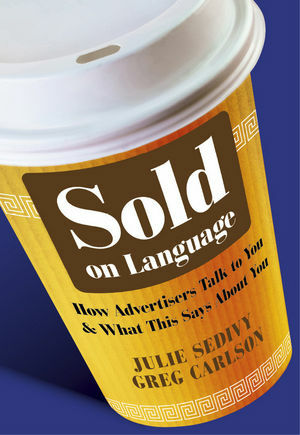 Julie Sedivy is Adjunct Professor of Linguistics and Psychology at the University of Calgary, Canada. She has published dozens of research articles on her experimental studies of language comprehension and production in children and adults. She has served as Associate Editor for the journal Linguistics and Philosophy, and as a consulting editor for the Journal of Experimental Psychology: Learning, Memory and Cognition. Greg Carlson is Professor of Linguistics, Philosophy, and Brain and Cognitive Sciences at the University of Rochester, US. He has authored or co-authored more than a hundred articles on natural language semantics and psycholinguistics. He is the Editor of Language, the journal of the Linguistic Society of America. Preface. 1 The Power of Choice. 3 The Attentional Arms Race. 4 We Know What You’re Thinking. 5 Why Ads Don’t Say What They Mean (Or Mean What They Say). 8 The Politics of Choice.